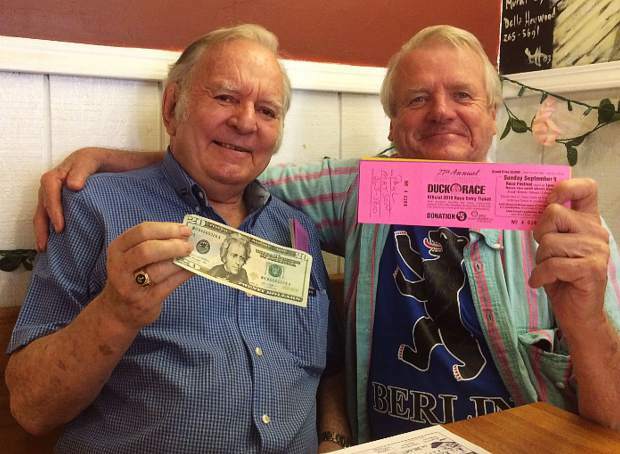 Beryl Robinson, left, recently sold his 20,000th ticket to Paul Matson for the Rotary Duck Race, which returns to Nevada City for the 27th year on Sunday. Recently I had the chance to hook up with Beryl P. Robinson Jr. over breakfast at the Nevada City Classic Cafe. For years he’s been leading the charge for the 49er Rotary Club’s effort to sell Duck Race tickets. Beryl is by far their preeminent sales person. There are a number of reasons for his zeal on this project. One, he’s a Rotarian, and the money raised is well spent right here in western Nevada County. Two, the funds contribute to sponsoring the annual Constitution Day Parade, founded by Colonel William (Bill) Lambert. And lastly, he’s a Mason and as such serves as a signer of the Constitution at the reenactment preceding the parade. Those are pretty good reasons. It was my privilege to be allowed to purchase Beryl’s 20,000th ticket! At five bucks a pop, he has now personally sold $100,000 worth of Duck Race tickets. I will admit, I’ve been asking for years to be allowed to buy that particular ticket (plus a few more). These Rotarians spend 100 percent of the Duck Race proceeds on local causes. Those have included the North Star House Heritage Garden, landscaping at the Miners Foundry, Pioneer Park picnic tables and cleanup, as well as scholarship programs at Seven Hills Middle School and Nevada Union High School, plus major sponsorship of the parade, to name a few. So far the Duck Race has raised over $1.25 million! Beryl reiterated that the point of this accomplishment was not about him, but rather the parade, the Duck Race now in its 27th year and the Masons, also a major parade sponsor. He’s been selling these tickets for all 27 of those years, methodically making six phone calls a day to sign people up. Let’s talk for a moment about Colonel Bill Lambert who started the parade in 1967 with the expressed idea of honoring, understanding and appreciating the Constitution of the United States. In his day, Bill Lambert was the parade’s principal advocate and worker bee. He worked on its details 12 months out of the year. It’s worth noting that the Famous Marching Presidents present an award every year in the name of the late Col. Bill Lambert. It recognizes someone’s significant contributions to Nevada City and to the “Nevada City way of life.” This year, Grass Valley Mayor and longtime community leader Howard Levine has been selected as recipient of the 29th Annual Col. William H. “Bill” Lambert Award. The Gold Country Duck Race is a big part of the weekend’s celebrations. Things begin at 1 p.m. at the bottom of Broad Street along Deer Creek at the Century 21 Cornerstone Realty parking lot. It offers a “bird’s eye view” of the ducks braving the rapids of Deer Creek. There are a lot of prizes, but the big cash awards are $5,000, $1,000 and $500. Mr. Robinson has sold tickets to the top-prize winner twice, the second-prize winner once and third-prize winner many times. The parade begins as usual at 2 p.m., Sunday, Sept. 9, at the top of Broad Street. At 1:30 p.m. on parade day there’s a reenactment of the signing of the Constitution sponsored by Nevada Lodge 13. They’ll be dressed to a tee in period perfect and correct Colonial costumes. It’s an important, fun, hometown event. 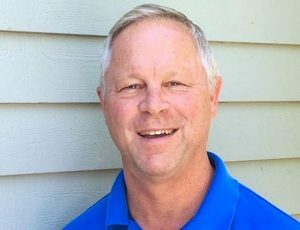 Paul Matson, who lives in Nevada City, is a member of The Union Editorial Board. His opinion is his own and does not reflect the viewpoint of The Union or its editorial board. Write to him at EditBoard@TheUnion.com.